Is available with standby voltages of either 3.3V or 5V. 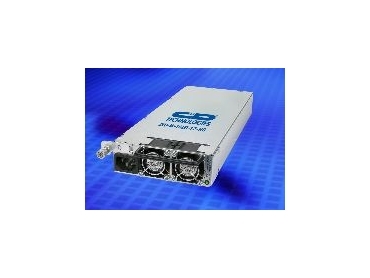 C&D Technologies, represented by Adilam , has announced the availability of a new ac/dc front-end power supply. The D1U-W-1600-12-HC delivers up to 1600W (220Vac), 1200W (110Vac) from its 12V output. The 1U high unit has leading power density of 17.5W/cu.in (1.1W/cm3) and delivers highly efficient, reliable performance. Typical applications for the D1U-W-1600-12-HC include blade servers, workstations, storage systems and any system using a 12V distributed power architecture. The unit uses proven topology and uses high-density dc/dc packaging techniques to maximise space efficiency. Planar magnetic devices are used to provide better quality and tighter process control. * Optional 1U 19in. Powershelf. The D1U-W-1600-12-HC is available with standby voltages of either 3.3V or 5V. Key features of the comprehensive specification include N+1 redundancy, hot-swapabilty, active current share, an I2C bus, status indicators and over-voltage, over-current and over-temperature protection. Overall dimensions of the unit are 304.8mm x 120.7mm x 40.6mm. Operating temperature range is 0°C to +50°C. The enclosure incorporates cooling fans. Three D1U-W-1600-12-HC units fit into an optional 1U high 19" wide Powershelf, for a total system power of 4,800W. "Our engineering team did an outstanding job in leveraging the high density board mount power packaging techniques in this D1U product line,” said C&D's director for business development, Kulbir Dhillon. “The power density for the output power train is 90W/cubic inch, making it possible for the overall power density to be 17.5W/cubic inch for the power supply. “This D1U product line is optimised electrically, mechanically and thermally to meet our customers' expectations," added Mr Dhillon.